Jailed evangelists preach to would-be murderers. NEW DELHI (Morning Star News) – When evangelists in India were accused of fraudulent conversion in a village at a time when they were hundreds of miles from it, they knew powers beyond their control were at play. Pastor Kasiram Meghwal, 46, was leading his church in Choru, Rajasthan, 410 miles from the village near Khajuwala where he was accused of trying to fraudulently convert people on May 20, his attorney said. Evangelist Sahiram Nayak, 34, lives 136 miles from Khajuwala in Sri Ganganagar and was attending his church in Rai Singh Nagar at the time, the lawyer said. A third accused Christian, 32-year-old pastor Vijender Singh, was leading Sunday service at his church in a different area of Khajuwala at the time of the alleged fraudulent conversion attempt at Hindus’ homes, according to the attorney. 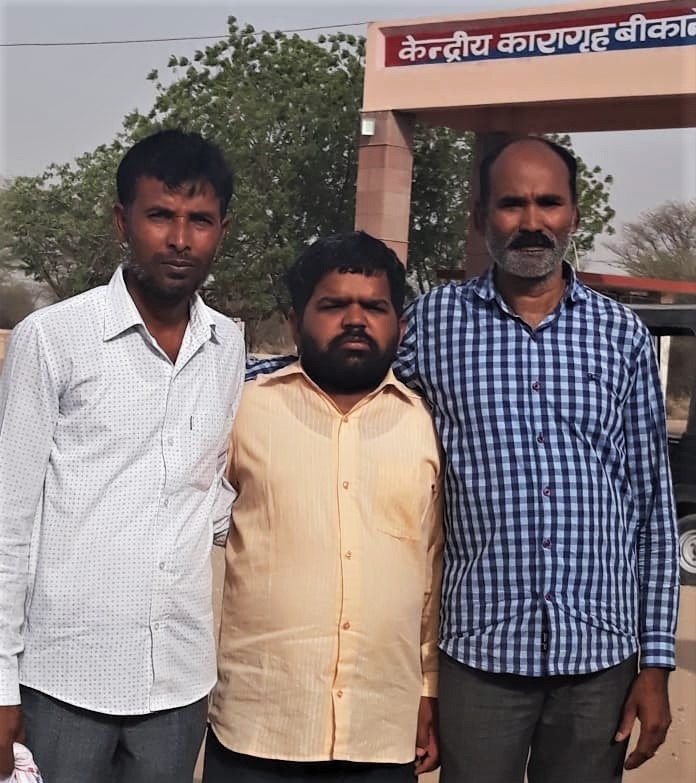 The three Christians came together in the Khajuwala area on May 22 to proclaim Christ to villagers, but the First Action Report (FIR) filed by area resident Rameshwar Lal alleges that on May 20 they offered him 100,000 rupees (US$1,450) and 50,000 rupees (US$730) to another area Hindu to convert, attorney Subodh Mathews told Morning Star News. Having obtained bail for a previous false charge, the three Christians were devastated to be jailed again on May 24 under a statute against “outraging religious feelings.” Their plea for bail was denied. Undaunted, the Christians told the convicts about Christ and held a Sunday worship service inside the prison on May 27, he said. “We got the opportunity to share inside the jail to murderers,” he said. With much difficulty they were able to obtain bail on May 29 and were released. On May 22 they distributed Christian literature and New Testaments among families of village 16 BD and then went to the home of Kaku Singh in village 14 BD, near Khajuwala in Bikaner District, Rajasthan, Pastor Singh told Morning Star News. After inviting them in, Kaku Singh told them that his wife was suffering from cancer, he said. “We shared the gospel with him and prayed for his wife and decided to leave,” but Kaku Singh insisted on offering them tea, Pastor Singh said. While the three evangelists were waiting, Rameshwar Lal called them out of the house on the pretext of asking questions about the literature they had given him earlier, the pastor said. When they stepped out of the house, a man named Darshan Singh suddenly attacked them, he said. Soon a mob of about 80 people surrounded them, carrying wooden sticks with intent to attack the Christians, he said. Though Kaku Singh would file the first case against them, he objected to the mob dragging the three Christians towards the main road with the intention of killing them, the pastor said. He said that as the mob shouted, “We will kill you today,” Kaku Singh called police to keep them from being killed. A police officer told the Christians that he immediately rushed to the site because he was aware of how Christians are being targeted in India, the pastor said. Surrounding the police van carrying the three evangelists, the mob demanded that they be handed over to them or they would set fire to the police van, he said. Police managed to bring the Christians to the Khajuwala police station for questioning. Officers treated them with respect and consideration, the pastor said. Kaku Singh accused the three Christians, all members of the Brethren Assembly, of trying to lure him and Lal to convert to Christianity. Since being bailed out, two court hearings have passed, one on June 5 and another on June 30, though no formal charges have been filed. Church leaders believe the accusations are rooted only in the desire to harass the Christians. T.J. Joseph, senior leader of the Brethren Mission, said legal proceedings could harass the evangelists for years. “Though they have been bailed out, they have to travel long distances for every court date of theirs,” Joseph told Morning Star News. We are praying for persecuted Christians in Nigeria, India, Kenya, Uganda and Egypt. God Bless you with much strength, hope and His comfort. Hindutva ideology being espoused by the religious bigots supported vociferously by RSS and BJP is raising its ugly head. The time has come for all the Christians all denominations to unite and confront these criminal elements in the Indian Society. They are not nationalists rather they are cowards and terrorists. because they are the ones who are spreading communal hatred that they should have been ideally booked under Sec. 295A, But the Indian Police as usual they are the His Masters Voice would slap false charges against such Christian priests only. All their anti-conversion laws are illegal they need to be challenged in the Supreme Court. As there is a new ground for challenging it legally. People should come forward to support this initiative.